One remark stuck out when John DeFilippo recently cracked the book on the criteria important to him at quarterback as the new Vikings offensive coordinator. Among the youngest quarter of NFL OCs, the 39-year-old DeFilippo still brings with him to Minnesota a well-traveled background featuring an array of quarterback talents and schemes. He’s been a part of draft processes that led to Carson Wentz, Derek Carr, Mark Sanchez and JaMarcus Russell with early selections. 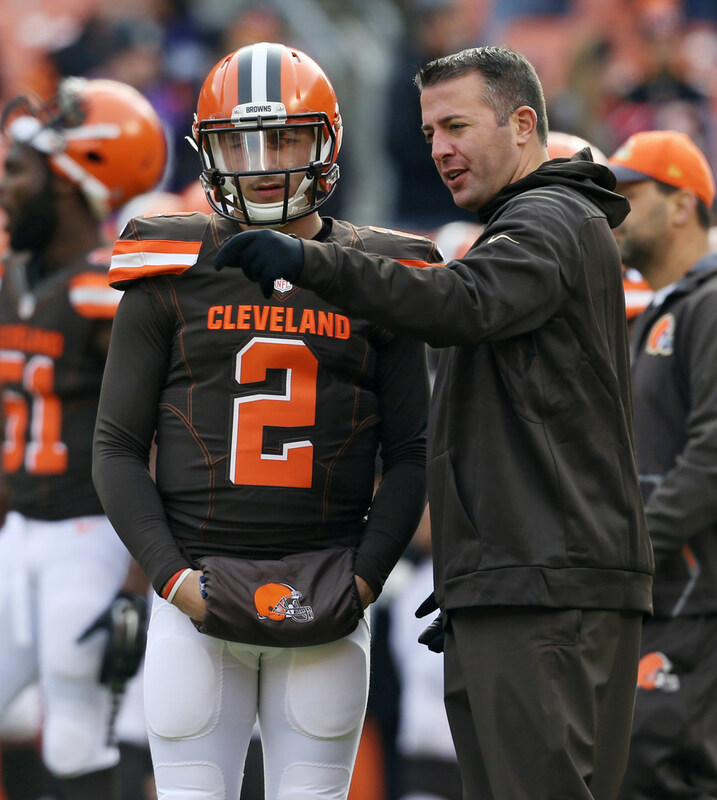 DeFilippo also called plays for Johnny Manziel in his second season. 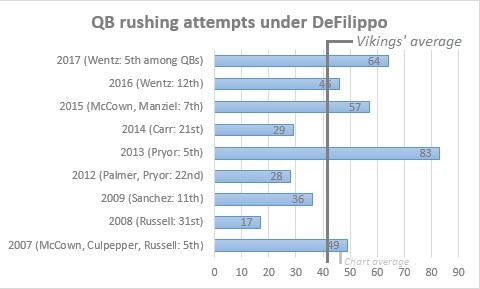 So DeFilippo’s talk of mobility, or avoiding a lack thereof for the Vikings’ 2018 quarterback, is more than lip service. Russell, Manziel and even Sanchez aren’t resounding success stories, but DeFilippo’s brief stop with each quarterback should widen the coach’s scope during what was described as his “major part” in the Vikings’ decision. The Vikings are no strangers to mobile quarterbacks having started Tarvaris Jackson, Christian Ponder, Joe Webb, Teddy Bridgewater and Case Keenum in the past decade. DeFilippo’s personal experience still comes at a greater pace. DeFilippo’s first run as an NFL coordinator was a failure. But it’s one he shouldn’t wear akin to Pat Shurmur’s dud stint as Cleveland’s head coach. The 2015 Browns season with DeFilippo at OC began as a debacle, led by three people he inherited. Team stars Josh Gordon and Manziel were either suspended or in treatment facilities by the spring. DeFilippo’s offensive line coach, Andy Moeller, was let go in September while being investigated for alleged domestic violence. What the Browns produced were eight efficiently lackluster starts from Josh McCown and six games of the Manziel roller coaster. With Gary Barnidge and Travis Benjamin the leading weapons, both quarterbacks combined for 20 touchdowns, 12 turnovers and only three wins. Manziel’s 230 rushing yards also ranked 10th among passers that season. DeFilippo has overseen some great footwork, too. Two of the seasons with fewer rushing attempts by his QBs — 2014 with Carr and 2012 with Palmer — saw each passer rank sixth in sack percentage that season. The past two seasons with Wentz have marked the first campaigns where a DeFilippo-coached NFL quarterback ranked in the top half in both sack percentage (Wentz was 12th in 2016 and 14th last season) and rushing attempts (12th and 5th). Athleticism was one of Keenum’s strengths during his breakout season. He was one of the league’s most-pressured quarterbacks, according to Pro Football Focus, and yet minimized the damage by scrambling to a sack rate that trailed only the names Rivers, Brees, Ryan, Roethlisberger and Carr. The Vikings need to weigh his strengths and deficiencies against the other options, such as quarterbacks in questionable health with Teddy Bridgewater and Sam Bradford all the way up to the likely bank-breaking Kirk Cousins. The decision at quarterback must come first. But whatever scheme is run under DeFilippo may incorporate West Coast philosophies given his experience with the system from all the way back to his days as a Notre Dame graduate assistant to his two stints under Greg Knapp, Jeff Garcia’s former play caller, and his most recent experience in a diverse Eagles approach under Doug Pederson, an Andy Reid/West Coast disciple. DeFilippo’s top three criteria for a quarterback seem to reflect that background, which also includes a penchant for athletic passers.